You know what they say about fireworks on the 4th of July! We both met on America’s Birthday the year of 2013 when Tyler came to visit his closest high school friends in NYC. Kimberly at the time had just finished college and was living in the East Village. Little did we know our chance encounter through mutual friends would end up changing things forever. When we both met, it didn’t immediately make sense due to the distance between us. 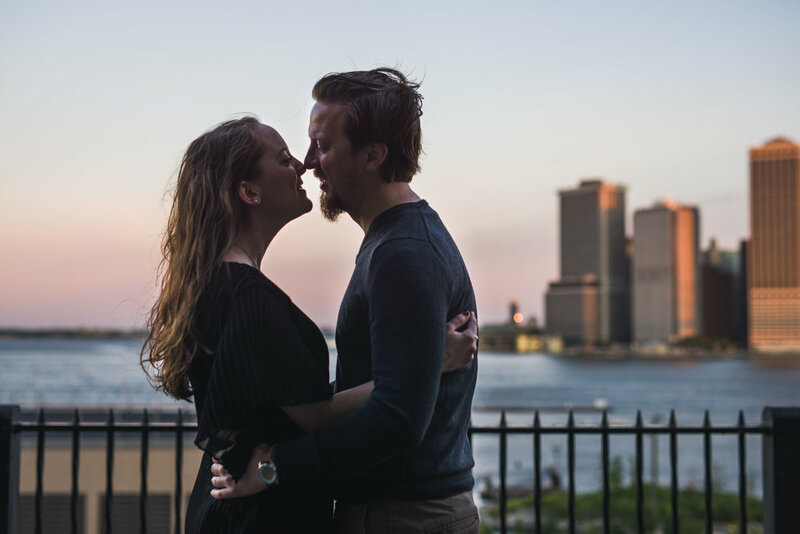 Tyler was living in DC and Kimberly had no plans to leave New York. Yet, after we met, we never lost touch. Sharing music, talking constantly, and becoming best friends without even being in the same city - it became more and more clear that we should be together. Less than a year after we met, Tyler was ready to return to NYC where his Mom’s family lives and he was originally born. As we envisioned making this a reality over dollar oysters, we came up with the fun idea for Kimberly to take a one-way bus down to DC. Together we rented a UHaul and packed up all of Tyler’s belongings over a weekend in April 2014. Perhaps our most important luggage was Tyler’s cat, Lenox, who we’ll both admit is now more Kimberly’s cat. He sat in the middle seat the whole drive and meowed his way into Kimberly’s heart. (We’d later find out they even share the same birthday). That move is what changed our lives, hearts, family, friends, and most importantly, our relationship forever. Tyler proposed on December 23, 2016 while Kimberly’s parents were on a flight from San Diego to NYC to join Tyler’s parents and family for their large Christmas Eve celebration for the first time. As we look forward to spending our wedding day together with you, we can’t wait to introduce our closest friends and family to each other. We are so lucky and excited for everything ahead, but most importantly to have you all be a part of our journey. Thank you to our wonderful photographer Kent Meister - info@kentmeisterphotography.com.